Located in the Ark, The Gathering room is ideal for family renunions, business meetings, training seminars, church retreats, etc. This room is ideal for groups ranging from 20 to 80 people. Rental rate is $375 + hst per day. Rate is reduced when 3 or Motel's or Villa's are rented. Please call us for more information. The Astrolabe Pavilion is an outdoor meeting facility that can accommodate groups ranging in size from 20 to 100 people. The size of this facility is 30' x 60' and includes picnic tables & a bbq. The rental rate is $150 + hst per day. 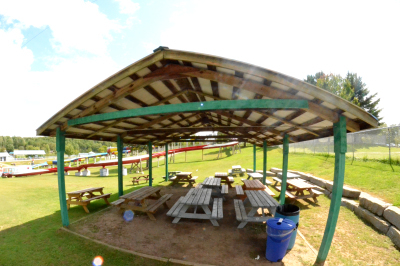 The Upper Shade Shelter is located in the Waterpark next to our red waterslide. This facility can accommodate 20 to 75 people and includes picnic tables. The Upper Shade Shelter is only available when the Waterpark is open. The rental rate is $50 + hst per day.